Earlier this month, I discussed the importance of saving, as well as the important things to consider before you start saving. This is, after all, National Savings Month. I would now like to take the term saving one step further by comparing savings in local investments to those in offshore investments. I will never forget my first holiday in Johannesburg. Living in Bellville for the first six years of my life led me to believe that Bellville was the centre of the universe, that the planets revolved around it and that the sun rose and set there. Imagine my shock when I set foot in Johannesburg for the first time at that age! That was when I realised how small Bellville actually was, and more importantly, how massive the world out there was. Isn’t saving in offshore investments too complicated? In the same way the world opened up to me as a six-year-old, the investment world has opened up for us over the last two decades. Up to July 1997, South Africans were largely confined to saving locally. In March 1997, the minister of finance announced that up-to-date tax-paying individuals over the age of 18 were allowed to invest up to R200 000 offshore. This really wasn’t much, and the administrative process attached to getting tax clearance hardly made it worthwhile. Today, 21 years down the line, we are allowed to apply for tax clearance to invest a maximum of R10m offshore per calendar year. Furthermore, the tax clearance process has become much simpler and individuals may now invest up to R1m offshore without obtaining a tax clearance certificate. Saving offshore, therefore, isn’t more complicated than saving locally, and it’s just as easy to monitor your performance. Aren’t returns on offshore investments much lower than those earned on local investments? When we consider the actual returns (excluding dividends) yielded by the British (FTSE 100) and USA (S&P 500) markets, their returns of 9% and 10% respectively over the last 30 years (since 1988) compared to the FTSE/JSE All Share Index’s 16.1% per year over the same period, places into context why first-world countries perhaps didn’t succeed in attracting offshore savings as well as they would have liked to. When we take into consideration the rand’s weakening against the British pound and the US dollar, however, a whole new picture emerges. In rand-terms, the FTSE 100 has grown by 14.4% per year since 1988, while the S&P 500 outperformed our local market by delivering 16.6% growth per year. Let’s suggest that you had R10 000 to invest in 1988. When we take the average inflation rate of 7.6% since 1988 into consideration, your initial R10 000 investment would be worth just over R90 000 today. If you had invested that R10 000 in local shares (FTSE/JSE All Share Index) and considered the fact that South Africa at the time was on the verge of a new democracy, and also economically one of the fastest-growing countries in the world in the mid-2000s, your investment would have been worth R900 000 today, offering you nearly 10 times more purchasing power than 30 years ago. If you had invested the same amount in a first-world country like the USA (S&P 500), your investment would have been worth in excess of R1m. 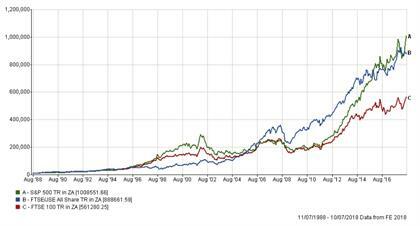 Please note that I’m not saying that the South African stock market is inferior to the S&P 500 in any way. Each offers amazing benefits in their own right. But there’s no harm in broadening your horizons by asking your financial adviser or portfolio manager what options are available to you in terms of offshore investments – not just outside of your ‘Bellville’, but outside the South African boarders, especially since it has now become so easy to compare apples with apples.